For other uses, see Sprinkles (disambiguation). Sprinkles, chocolate syrup and whipped cream on top of ice cream. Popular terminology for this confection tends to overlap, while manufacturers are more precise with their labeling. What consumers often call "sprinkles" covers several types of candy decorations that are sprinkled randomly over a surface, as opposed to decorations that are placed in specific spots. Nonpareils, confetti, silver, gold, and pearl dragées – not to be confused with pearl sugar (which is also sprinkled on baked goods) – and hundreds-and-thousands are all used this way, along with a newer product called "sugar shapes" or "sequins". These latter come in a variety of shapes, often flavored, for holidays or themes, such as Halloween witches and pumpkins, or flowers and dinosaurs. Candy cane shapes may taste like peppermint, and gingerbread men like gingerbread cookies. Sanding sugar is a transparent crystal sugar of larger size than general-use refined white sugar. Crystal sugar tends to be clear and of much larger crystals than sanding sugar. Pearl sugar is relatively large, opaque white spheroids of sugar. Both crystal and pearl sugars are typically used for sprinkling on sweet breads, pastries, and cookies in many countries. Some American manufacturers deem the elongated opaque sprinkles the official sprinkles. In British English, these are sugar strands or hundreds-and-thousands (the latter term alludes to their supposed uncountability). In the Northeastern United States, sprinkles are often referred to as jimmies. "Jimmies", in this sense, are usually considered to be used as an ice cream topping, while sprinkles are for decorating baked goods, but the term can be used for both. The sprinkles known as nonpareils in French and American English are tiny opaque spheres that were traditionally white, but that now come in many colors. The sprinkle-type of dragée is like a large nonpareil with a metallic coating of silver, gold, copper, or bronze. The food-sprinkle dragée is now also made in a form resembling pearls. Toppings that are more similar in consistency to another type of candy, even if used similarly to sprinkles, are usually known by a variation of that candy's name—for example, mini-chocolate chips or praline. Nonpareils date back at least to the late 18th-century, if not earlier. They were used as decoration for pièces montées and desserts. The candy company Just Born cites its founder, Sam Born, as inventing the "chocolate" sprinkles called "jimmies" (which may never have contained any chocolate) in Brooklyn, New York. 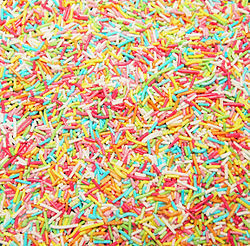 Dutch hagelslag (sprinkles) were invented in 1913 by Erven H. de Jong from Wormerveer. Venz, another Dutch company made hagelslag popular. Hagelslag is used on bread. Most of the time butter is spread out so the hagelslag does not fall off. After much research and venture, de Vries and Venz created the first machine to produce the tiny cylindrical treats. They were named hagelslag after their resemblance to a weather phenomenon prominent in the Netherlands: hail. Only hagelslag with a cacao percentage of more than 32% can bear the name chocoladehagelslag (chocolate sprinkles). If the percentage is under the 32%, it has to be called cacaofantasie or cacaofantasie hagelslag (cacao fantasy sprinkles). Sanding sugar has been commercially available in a small range of colors for decades. Now it comes in a wide variety, including black and metallic-like "glitter". Jimmies is the most popular term for sprinkles in the Philadelphia and Boston regions. The origin of the name "jimmies" is uncertain, but it was first documented in 1930, as a topping for cake. Though the Just Born Candy Company of Bethlehem, PA claims to have invented jimmies and named them after an employee, this is unlikely. The rumor that the name somehow refers to Jim Crow is also likely false. Another story attributes the name "jimmies" to Dr. Sidney Farber and Edward Brigham. Dr. Farber co-founded the Dana–Farber Cancer Institute in Boston, Massachusetts as well as a charity named after one of his child patients, The Jimmy Fund. Edward Brigham opened an ice cream restaurant called Brigham’s and charged an extra penny for chocolate sprinkles on a cone, which benefited The Jimmy Fund. The fund however was started in 1948, well after the first historical reference. In the Netherlands and Belgium, sprinkles—hagelslag—are commonly used as a sandwich topping. Sprinkles generally require frosting, ice cream, or some other sort of sticky material in order to stick to the desired food surface. They can be most commonly found on smaller confections such as cupcakes or frosted sugar cookies, as these generally have more frosting and smaller diameter than do cakes. In the Netherlands, chocoladehagelslag (chocolate sprinkles) is used as a sandwich topping (similar to muisjes and vlokken); this is also common in Belgium, Suriname, and Indonesia, once colonies of the Netherlands. These countries also use vruchtenhagel and anijshagel (made of sugar and fruit/anise-flavour respectively) on sandwiches (mainly at breakfast). In Indonesia, it is commonly known as meses or meises, presumably derived from the Dutch word of muisjes. In Belgium it is often called muizenstrontjes (mouse excrement) due to the resemblance with mouse excrement. Fairy bread is the name given to the children's treat of sprinkles or nonpareils on buttered white bread. Fairy bread is commonly served at children's parties in Australia and New Zealand. A dessert called confetti cake has sprinkles mixed with the batter, where they slowly dissolve and form little colored spots, giving the appearance of confetti. Confetti cakes are popular for children's birthdays in the United States. The Pillsbury Company sells its own variation known as "Funfetti" cake, incorporating a sprinkle-like substance into the mix. ^ a b "Etymology of Jimmies (Ice Cream Sprinkles)". snopes.com. Retrieved 2011-01-04. ^ "Our History". Just Born, Inc. Retrieved 2011-01-04. ^ "DE JONG'S". Provinciale Drentsche en Asser courant. 1913-04-19. Retrieved 2019-02-27. ^ "Venz". Venz.nl. Retrieved 2011-01-04. ^ "WHAT'S THE DIFFERENCE BETWEEN SPRINKLES AND JIMMIES?". Retrieved 12 December 2016. ^ Advertisement for McCann's food store, Pittsburgh Post-Gazette, December 4, 1930, p. 6. ^ Just Born Fun Facts; see also their photograph of a package of jimmies (on page 4 of their photo gallery Archived January 29, 2010, at the Wayback Machine), claimed to be from "circa 1930" and showing a trademark symbol. ^ "The Chocolate Sprinkle Sandwich". Math.union.edu. Retrieved 2011-01-04. ^ "Funfetti® Cake Mix with Candy Bits". Pillsbury Company. 2010-09-30. Archived from the original on 2013-04-20. This page was last edited on 30 March 2019, at 11:55 (UTC).